Gluten Free Tea Biscuits are a great way to start the day, perhaps with eggs or fruit and coffee. 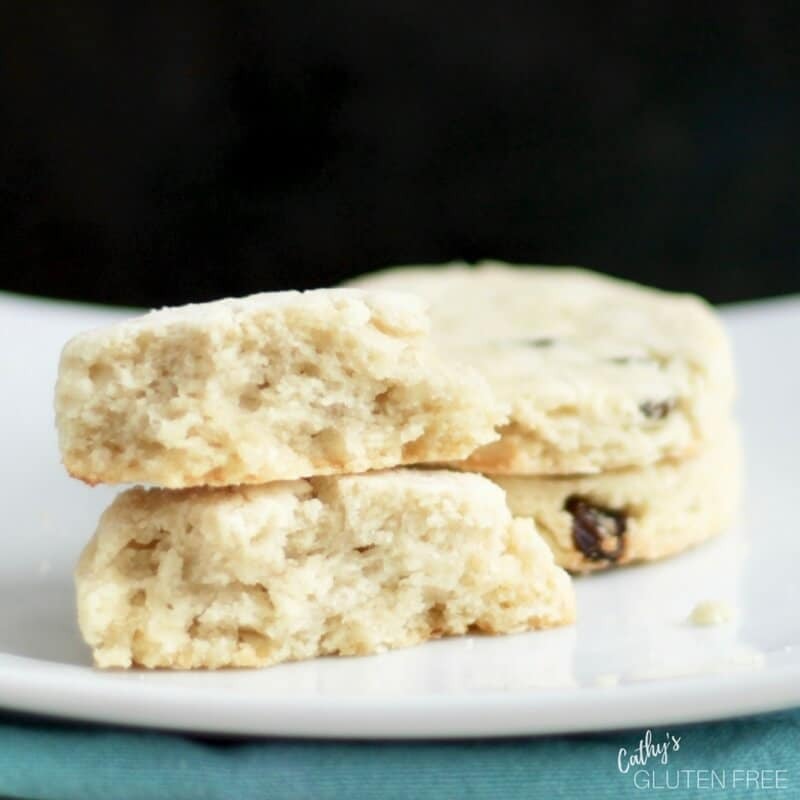 These can be made dairy free and with or without raisins, as you wish. On the rare occasion when my husband and I have the opportunity for a leisurely breakfast at home, or we’ve had overnight guests who can linger in the morning, we enjoy a “special” breakfast. Rather than the usual granola or smoothie, our special breakfast might be pancakes with maple syrup, omelette, frittata, or breakfast sausage with fried eggs and these tea biscuits. Then we enjoy finishing it off with a nice cup of coffee. I’ve worked hard to get as close as I can to replicating homemade tea biscuits from before my gluten free days. Charlie likes them with raisins, so I try to remember to include them. You may add or delete them as you wish. If you need to be dairy-free, you can substitute the butter in this recipe with lard. The recipe will turn out fine, but butter adds a nice flavour if you can have it. Top these tea biscuits as you wish. I’m very glad to be seeing more lower-sugar “jam” recipes lately like this Strawberry Chia Jam or jams that use natural sugars like this Easy Jam Recipe. 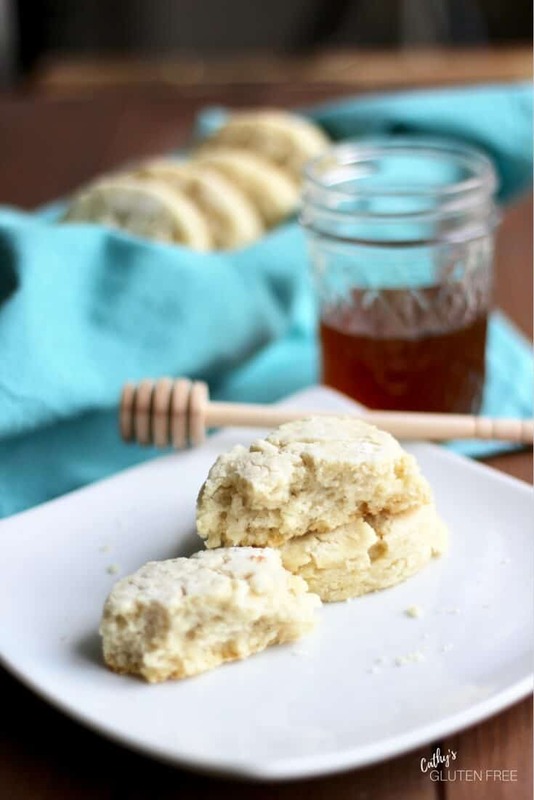 We enjoy raw honey with warm tea biscuits fresh from the oven. 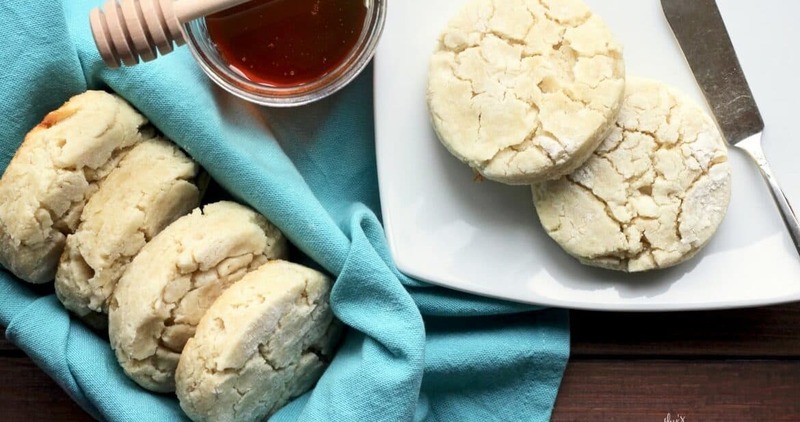 Nut butters are probably the best sugar-free option with tea biscuits. Of course, they’re also great plain with soft, runny eggs! In a large mixing bowl, whisk together the flours, sugar, baking powder, and salt. Using a pastry blender, cut the butter into the dry mixture until it is about the size of small peas. In a small mixing bowl, whisk the egg and milk together. Stir this mixture into the dry ingredients just until they are combined. Add the raisins, if you are using them. On a floured surface with a floured rolling pin, roll out the dough until it is about 1/2 inch (1.27cm) thick. (Use any of the flours that are in the recipe. I usually use rice flour for this.) Cut with sharp cookie cutter about 2 inches (5.08cm) in diameter and place 1/4 inch (0.635cm) apart onto a greased or parchment-lined baking sheet. Bake for 15 to 18 minutes until biscuits are just starting to brown around the edges at the bottom. These look delicious! I’ll bet they’d be good with herbs, too, if I eliminate the sugar and make them a savoury biscuit. Must try! Pinning. I think they would be great with herbs! We can make all sorts of variations! I continue to be impressed by your gluten-free creations! I’ve worked with a fair number of different flour types over the years but I’ve not tried arrowroot yet. It’s always been an ingredient of interest to me though. Do you find that it has a fairly neutral flavour, or does it contribute any character of its own to the recipe? Regardless, they look like a wonderful tea-time treat to me! I find that arrowroot flour has a neutral flavour. That’s one of the reasons I like it. 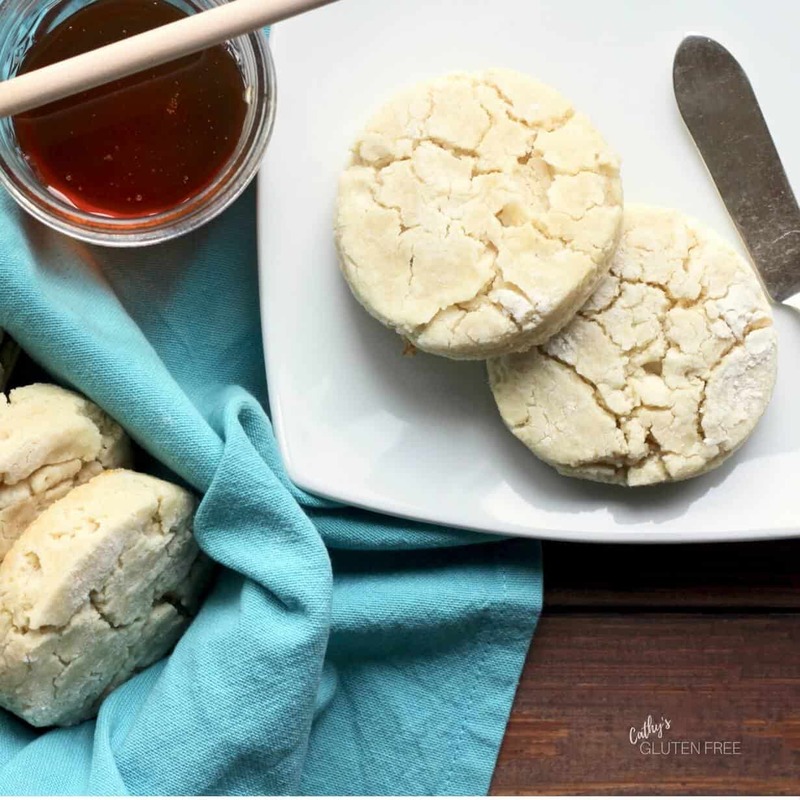 These biscuits definitely play a supporting role to whatever you’d like to put on them. Thanks for stopping by, Sean! Yum! I love those mornings where you have time to linger over breakfast. These look great, Cathy! Thanks, Leslie! Yes, those leisurely mornings are too few and far between. What a great, easy recipe! 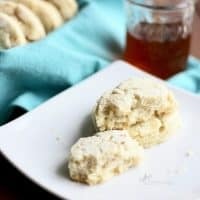 I have never baked with arrowroot flour, but your biscuits look so delicious that I think I should try! I love the crinkled look of them! I hope you enjoy the biscuits, too!